Don’t throw away those Broccoli Stems. Today I’m going to share with you a kitchen tip that I have been using for a long time. 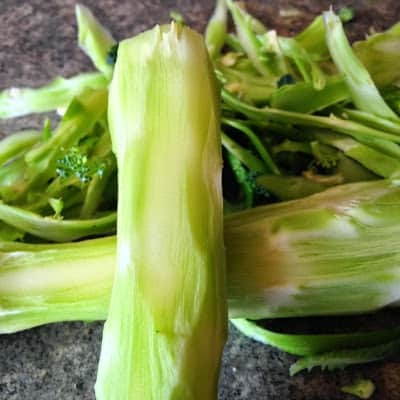 The next time you buy broccoli and you are going to use the broccoli florets only, save the stems. 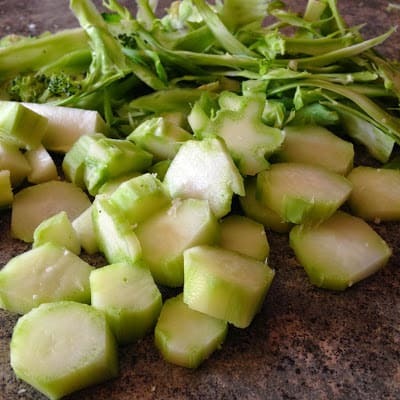 You can peel the stems and leave them whole, slice the stems or chop them into cubes. Use them right away or freeze them for later. Most vegetable stems can be tough, woody and lack flavor. However, broccoli stems are tender and have tons of flavor and vitamins. Add the stems to soups, stews and use in stocks. 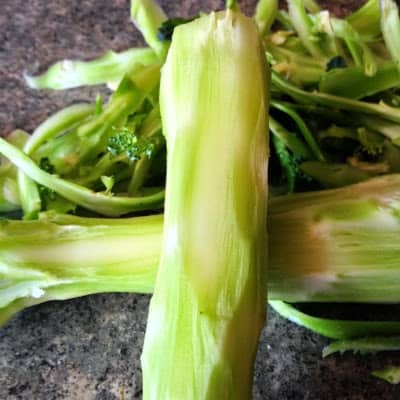 Broccoli stems can be shredded and then added to salads and slaw recipes too. When I make a recipe for creamed broccoli soup, the majority of the broccoli in the soup is from the stem portions. Broccoli stems hold up well, which makes them ideal for longer cooking times. Broccoli florets can then be added at the end of the cooking time. So the next time you buy a bunch of broccoli, keep the stems! Peel the stems, toss them into a ziplock freezer baggie, date the baggie and put the baggie in your freezer. The next time you want to make vegetable stock or broccoli soup, some of the prep work will be already done. I just love this post! 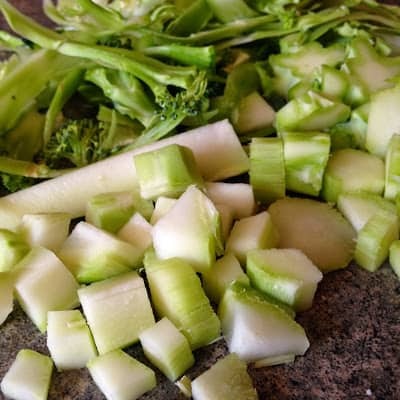 – I've used Broccoli stems for years but never thought of freezing them – genius idea! Thank you for networking with us on the CLIMB! You are a girl after my Yankee heart. I would love to use my stems. Pinned this. Thanks for bringing this by Weekend Bites. What a great tip! Thanks for sharing on Weekend Bites! What a great kitchen tip, I just love the broccoli stems. Hope you are having a fantastic week and thanks so much for sharing with Full Plate Thursday. These are such great tips, never thought of adding them to soups either! Thank you so much for linking up at Tasty Tuesday! Your recipe has been pinned to the Tasty Tuesday Pinterest board! Please join us again this week! Mine would never make it to the freezer….youngest son and I eat them raw. So good! Great post! I never thought to add them to soups. I think they do too, Christina!! Hi Lynn, nice posting. Usually I don't throw the stems too, I slice it thinly and blanch together with the broccoli florets then stir fry with garlic and oyster sauce. Nice and crunchy. Love your idea to make into vegetable stock or stew. Thanks for sharing. 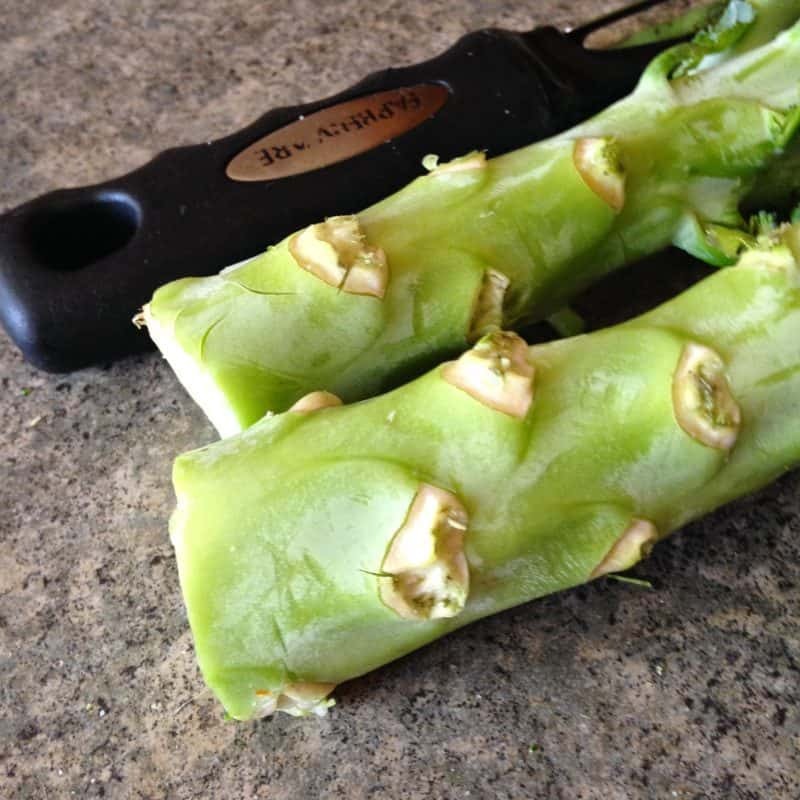 I slice off the outside of the stems and cut the center into sticks and eat them raw. Absolutely love broccoli stems.